Louis Theroux is often seen as the master of objective documentaries on uncomfortable subjects, utilizing a very British sense of awkward detachment to disarm and penetrate his subjects in order to get to the truth behind the walls they put up. The films he is most famous for is those in which he is the most removed from the subject he is covering, be it the venomous hatred of the Westboro Baptist Church or the brutality of the Miami prison system. However it is for precisely the opposite reason that his latest film entitled simply Savile is such an arresting piece of television, which sees Theroux trying to understand the human impact of Savile’s crimes and reconciling this with the man he thought he knew. Although the Savile case seems to have been covered countless times in endlessly horrifying detail, Theroux brings an utterly distinctive perspective that makes this a fascinating but heartbreaking take on a difficult subject. 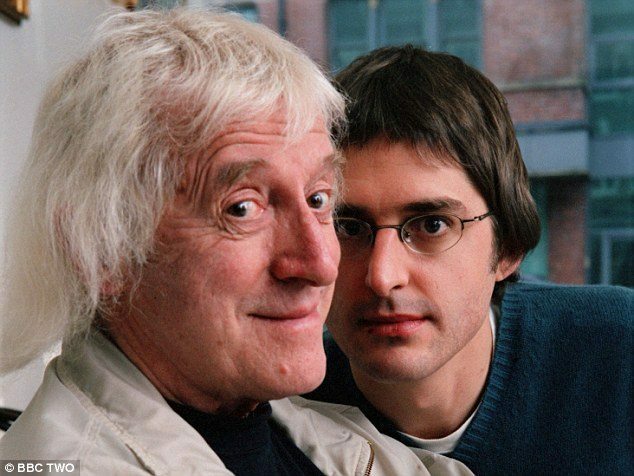 Theroux’s unique position comes from the fact that he knew Savile fairly well, having made a documentary about him in 2000 and staying in touch with him semi-regularly until the time of his death. Theroux admits that he saw Savile as a friend and that he seemed genuinely funny, charming and generous, albeit a bit eccentric, and it is Theroux’s internal conflict of trying to reconcile this image with the horrific crimes that emerged after his death that gives this documentary its power. In the wake of the Savile scandal many commentators tried to distance themselves from the idea that they as individuals were taken in by Savile’s mask, but Theroux tackles this sense of personal guilt head on. Seeing him talk to the victims of Savile’s abuses is genuinely tough viewing, and its quietly heartbreaking when one victim says that their reaction to seeing Theroux’s initial friendly documentary with Savile was “Poor Louis.” Another says she feels he was “mentally groomed” by Savile. As much as this is a documentary about Savile and the terrible things he did, it is also very much a film about Louis and his guilt as he goes through his archive footage looking for clues as to Savile’s true nature. Some of it is chilling viewing today, as he casually gropes a woman in a restaurant whilst Theroux sits oblivious in the background, making us (and Louis) wonder with hindsight just how Savile remained infallible until his death. Perhaps the most disturbing conversation of all comes with Savile’s assistant of 30 years who still maintains his innocence and holds him up as a great man in spite of all those who have spoken out against him, suggesting that the spell Savile seemed to cast over those around him remains to this day. Theroux’s perspective makes him better placed than most to see this power, and his conclusion makes it clear that we all have to accept a burden of responsibility for being “beguiled” by this man’s persona and unprecedented influence. Despicable Me: Despicable, or delightful?